Visit a CITROËN dealer with the vehicle's V5 registration document and your personal identifi cation documents. 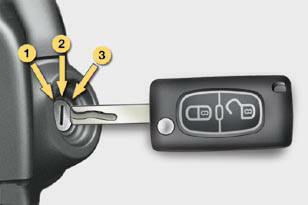 The CITROËN dealer will be able to retrieve the key code and the transponder code required to order a replacement key. The remote control does not operate when the key is in the ignition, even when the ignition is switched off, except for reinitialisation. Driving with the doors locked may make access to the passenger compartment by the emergency services more diffi cult in an emergency. As a safety precaution (with children on board), remove the key from the ignition when you leave the vehicle, even for a short time. Do not make any modifi cations to the electronic engine immobiliser system; this could cause malfunctions. Have the key codes memorised by a CITROËN dealer, to ensure that the keys in your possession are the only ones which can start the vehicle. Do not throw the remote control batteries away, they contain metals which are harmful to the environment. Take them to an approved collection point.